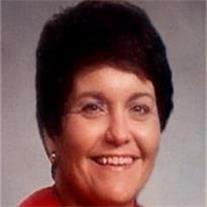 Nancy Lynn Elliott Farrill, 64, passed away Sept. 5, 2010. She battled Multiple Sclerosis for 29 years. She is survived by her children Kristen Neus (Kevin), Aaron Farrill, Amanda Kolski (Alexander), grandchildren Jessica Walder, Courtney Neus, Kendyl Neus, Connor Neus, Korynn Neus, and Alexandra Kolski. Nancy was a positive person even in adversity. Her faith was unwavering even to the end. Services will be held at the LDS church building at 495 S. Greenfield Rd., Gilbert AZ, on Friday, September 10, at 10:00 AM. Arrangements by Bunker’s Garden Chapel.